There is no Clay Class today December, 4th, and no 3D Studies Wednesday, December 6th. All classes resume to their normally scheduled days and times starting Thursday, December 7th. Check our website for our November and December calendar at www.arthaven.org/events. Looking for Something Fun to Do Over WInter Vacation? 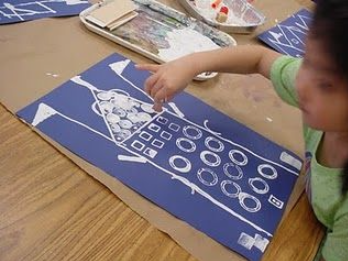 Take a Printmaking Workshop with Art Haven and The Cape Ann Museum! For more information visit https://www.arthaven.org/school-vacation. Saturday is our Holiday Tree Lighting and Open House at Art Haven. Come find your buoy on the tree, enjoy the caroling, help us countdown and welcome in the season by lighting the tree! Join us after in the Art Haven studios for crafts, snacks and more. See our studios and meet some of our teachers. Last Days to Paint A Buoy! Come by today and Wednesday to paint a buoy to adorn our Lobster Trap Tree, which will be lighted this Saturday, December 9th! Gift the Gift of Art for the Holidays! 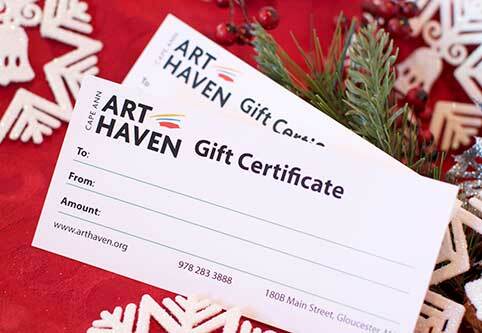 Give an Art Haven Gift Certificate as a gift. Choose from $10 (cost of 1 Open Studio), $20(cost of 1 After-school or Adult Class), $70 (cost of a package of 4 classes) or $150 (cost of a week of Summer Camp.) Information is taken at checkout through a form and Gift Certificate is mailed to you.